This warehouse ladder is a durable, one piece steel rolling ladder designed to provide safe access to high areas in commercial or industrial warehouse environments. Shipped set-up, this ladder is ready for use upon arrival. 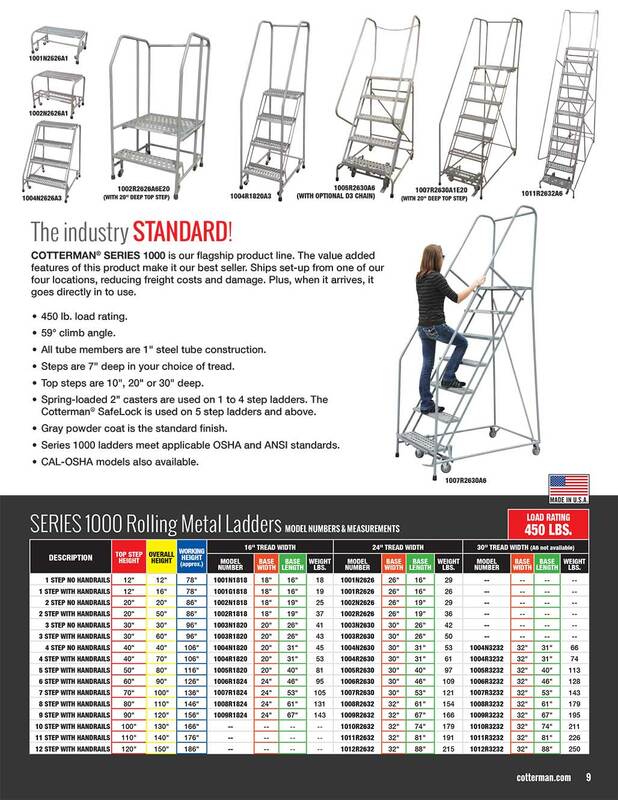 Series 1000 ladders meet or exceed OSHA 1910.29 and ANSI A14.7 standards and are available in Cal-OSHA models. This Series 1000 ladder has a width of 18 inches, a height of 1 step, features steel handrails, and A1 Expanded Metal Tread steps. Each step is 7 inches deep, with a top step depth of 10 inches. If you need a larger platform for the top step, 20 inch and 30 inch deep top steps are available. Spring-loaded 2" casters are used on 1 to 4 step ladders. The Cotterman SafeLock ™ is used on 5 step ladders and above. This ladder has a climbing angle of 59 degrees and a load rating of 450 pounds. Top steps range in depths of 10" 20" or 30"